African nations appear at the bottom of Transparency International’s latest Corruption Perceptions Index. Transparency gave the East African nation of Somalia its lowest rating on the list for the 12th time in 12 years. Transparency is a non-governmental anti-corruption organization. It rated a total of 180 countries on how corrupt their governments and public services appear to be. The ratings are based on findings by experts and public opinion studies. The index uses a 100-point scale to show corruption levels. More than two-thirds of the countries received less than 50 points, with an average rating of 43. 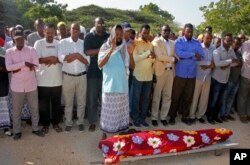 FILE - Mourners pray over the body of Somali journalist Mohamed Ibrahim, a news presenter for Kalsan TV, before his burial in Mogadishu, Somalia, Dec. 12, 2017. African nations had an average rating of 32 points. No nation has ever earned a perfect rating of 100. New Zealand leads the 2017 index with 89 points. Somalia received nine. Kate Muwoki is Transparency International’s expert on Southern Africa. She says most African governments are failing to deal with corruption. However, she says there are some leaders who have invested in systemic action to change behavior. Muwoki spoke to VOA from Berlin, where Transparency International has its headquarters. She praised a number of African countries where corruption does not appear to be a major problem. They include Botswana, Seychelles, Cabo Verde, Rwanda and Namibia. All five received a rating of over 50 in the latest index. She also noted that South Sudan is near Somalia at the bottom of the list. And Transparency identified rising corruption levels in Malawi, Madagascar, Mozambique and Guinea-Bissau. Yet Muwoki suggested that things may change because the African Union and several African leaders have made clean governance a top goal. The past year will be remembered as a time when several African leaders accused of questionable activities left office. No fewer than four heads of state suspected of financial crimes resigned over the past 12 months. They are Gambia’s Yahya Jammeh, Angola’s Jose Eduardo dos Santos, Zimbabwe’s Robert Mugabe, and Jacob Zuma of South Africa. A high-level corruption case also affected the government of Ethiopian Prime Minister Hailemariam Desalegn. He resigned this month following anti-government protests. Yet the corruption-accused president of the Democratic Republic of Congo has repeatedly postponed elections. And the leaders of Uganda, Equatorial Guinea, Gabon, Congo, and Cameroon have all remained in power while being suspected of wrongdoing. Corruption investigations continue into current and former officials across the continent. 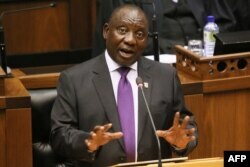 South Africa's President Cyril Ramaphosa delivers his State of the National address at the Parliament in Cape Town, on February 16, 2018. The new president of South Africa, Cyril Ramaphosa, has made fighting corruption a major goal of his administration. This week, he called for an investigation of the behavior of top government officials, starting with himself. In Nigeria, President Muhammadu Buhari announced that all national property recovered in an anti-corruption campaign would be sold. He said the money from the sale will go the country’s treasury. Buhari is the chairman of the AU anti-corruption effort. Transparency International’s Kate Muwoki says her group has noted and welcomed these developments. But she is urging people to keep up the pressure by shining light on suspected corruption. Anita Powell reported this story for VOANews.com. George Grow adapted her report for Learning English. Caty Weaver was the editor.